First of all this has got nothing to do with the post that I am writing, is just a new application on my phone, and few of my friends tried it out, I find it funny so I just post it anyway hope it makes you laugh. Damn this is ugly. I believe there's something that everyone will cherish during their schooling time, may be a special teacher, the food in the canteen, their library or may be their sports field. So this is what I do in school today, our SFI canteen dry me is cheap and it brings back to memories of us sitting at the canteen table bullshitting during break time. 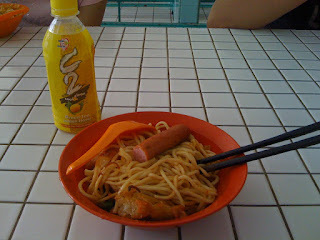 The good old time=) I wouldn't further discuss about the mee cause is just a simple dry mee nothing special inside except canteen aunty's hard work and sincere inside ( not sure about that it seems that she just simply campak everything inside) Haha.